With a 1.2-litre engine option, the Wagon R has gone peppy now. For starters, the new Wagon R is bigger and roomier, longer and wider. The look is not too different though. It's still got the tall boy design but more aesthetic now. The sides are no longer only slabs of steel. The side panels got lines which breaks the monotony and enhances the looks. The wheel arches look like scooped out creases. In the front, the split headlamps and the redesigned bumper and grille gives the Wagon R a premium look. Towards the rear, a black strip at the C pillar gives a floating roof effect. At the rear, the straight stacks of lights give way to Christmas-tree-like tail-lights. They also look a little Volvo-ish. The engineering team had the brief to make the flat and boxy Wagon R ‘car-like’, and at least to a certain extent they have succeeded. 82bhp, 4-cylinder, 1.2-litre engine (above) has a claimed mileage of 21.5kpl. The 3-cylinder1.0L 67bhp engine claims 22.5kpl. 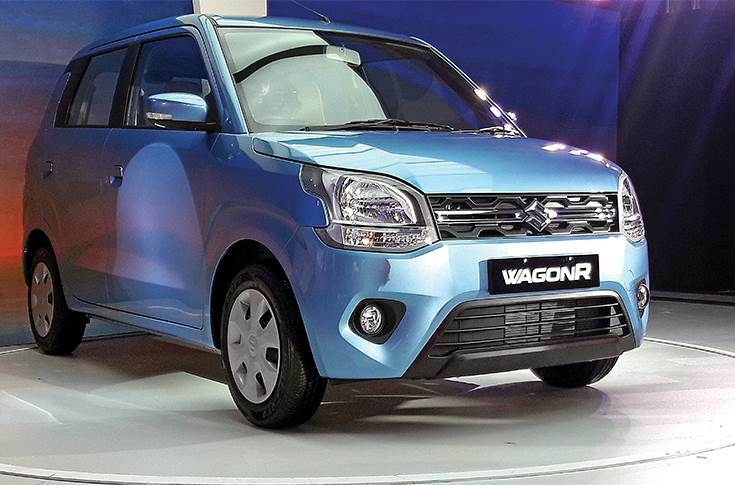 New WagonR shares about 17 percent of components with the earlier version. Inside, the new Wagon R feels premium compared to the earlier version. The 7-inch touchscreen improved infotainment system is a welcome feature. It supports Apple CarPlay and Android Auto as well as a Suzuki app that provides all the in-car entertainment and key vehicle information. A 'Smartplay Remote' feature allows the user to turn his/her smartphone into a remote controller for the system. The cloud-connected system is customisable. Steering-mounted controls are a good addition. The Wagon R now moves to the Heartect platform which is also shared by the Ignis, Swift, Dzire and Ertiga. The platform is lighter and stronger, designed to meet the crash norms and also helps achieve good fuel efficiency figures. The claimed fuel efficiency of the new model is 22.5kpl (1L engine) and 22.5kpl (1.2L engine). The new WagonR's wheelbase stands at 2435mm, which is 35mm longer than its predecessor. The front track gets widened by 140mm and the rear by 150mm, which should allow three adults to sit comfortably. All seats in the new Wagon R get fixed headrests. Wish at least the rear seats had adjustable ones. Newly designed infotainment system and steering-mounted controls would be major USPs for the new Maruti Wagon R.
The car's turning radius has gone up marginally from 4.6m to 4.7m. Thanks to the new platform, the car's boot space gets doubled to 341 litres (710 litres with second row folded). The rear seats also fold in a 60:40 split. The best part of the new Wagon R, I felt, is the 1.2-litre engine, an intervention based on customer feedback. The 82bhp (@6000 rpm) engine adds a lively dimension to the practical car. It is quite refined and the power delivery is seamless. The performance was impressive at high speeds too on the highway. What would have been better was if there was more feedback to the steering wheel at high speeds. The steering feels very light, which is best only for city traffic. I would have liked to hear less road noise during our highway drive though. The new Wagon R feels more stable than the earlier one at high speeds. The shift from ITL (independent trailing link) to a torsion link with the shift of platform seems to have a positive effect on overall stability and ride & handling. The new Wagon R gets premium treatment to appeal more to personal car buyers. It is not being aimed at fleet segment for now. The wider track and wider tyres also offer aid. The rim size remains the same at 14 inches, but tyre specs have gone up from 155/65R14 to 165/70R14 (for 1.0L VXI and 1.2 VXI, ZXI). The 1.0L LXI version gets 155/80R13, up from 145/80R13. Fancy alloy wheels to go with those tyres? You'll have to buy from the aftermarket because you won't get one with the car! Heartect (A) platform and a spare tyre well allows the new Wagon R to double the amount of boot space. Like the old one, the new Wagon R also gets the automated manual transmission (AMT) option. It seems that the engineers at Maruti Suzuki and Magneti Marelli (supplier of the AMT) have put good effort on it to make the transmission smooth. The 'shift shock', usually experienced in AMT cars, was quite low in the new Wagon R. I felt it distinctly during the shift from first to second, but it smoothens out thereafter. The lightweighting in the car also helps it to be swift. The new Wagon R is lighter than its predecessor by about 65kg. The usage of 40 percent high-tensile strength in the body structure would mean it is safer too than the earlier Wagon R.
The boxy and flat WagonR goes under the scalpel to get creases and lines. No alloy wheels as standard fitment, but wider tyres. Turning radius a tad wider now. Overall, as expected and as it should be, the new Wagon R is a significantly better proposition than the outgoing model as it is more appealing aesthetically and offers better performance and features. Brand Wagon R has sold 2.2 million units since launch on December 25, 1999 and enjoys a 20 percent share in the A2 segment of the Indian car market. Twenty-four percent of the customers apparently buy another Wagon R to replace or add the existing one. Maruti Suzuki wants this figure to go up. That will be the challenge to the sales team as the market has also become more competitive. What can be fairly well expected is that a good number of 'practical' individuals will like this car. New car buyers now have another option with a strong proposition.